Ever wanted to design your own T-Shirts? Now you can with our screen printing workshop. Transform a plain T-Shirt into a work of art using our vinyl cutter and silk screen printing tools. 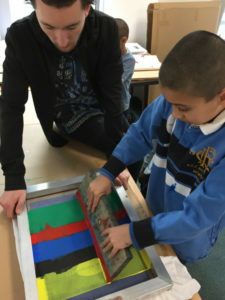 This introductory workshop will show you how to design your t-shirt artwork, how to use the vinyl cutter, and how to screen print. The vinyl cutter is arguably the easiest machine in The Making Rooms and it produces great stencils for screen printing. Unleash your creativity and have a go at making your ideas into a reality at The Making Rooms. Important: We will provide all equipment and paints, just bring along your T-Shirt, Hoodie, Sweater or whatever it is you want to print onto! NB/ Under 14s must be accompanied by an adult at The Making Rooms.